The Comet: Rain, rain and... summer!! Gaaah! As I've already told you, I've been looking at a lot of Friends lately. The only problem with that is that they have subtitles in spanish... Usually, that wouldn't be a problem at all, because it's only good practise for me to read them. I've forgotten almost all of my spanish since I haven't studied it after I started at the university, but now it's all starting to come back to me. And that's a problem!!! Because it's my sixth language in the head! And that is waaaaay too much for me to handle! :D I've tried not to read the subtitles and only listen to the english spoken, but it's hard, well almost impossible! I'm too used to reading subtitles so I can't just shut them out. 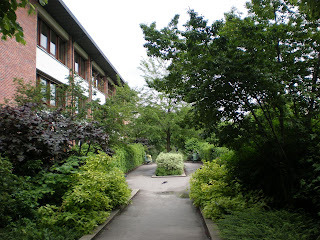 It's called Promenade Plantée and it's a kind of a sidewalk with a lot of trees, bushes and flowers. But what makes it special is that it's not a normal sidewalk beside the street, it's actually high up in the air on a sort of a bridge! The part of the houses you see on the picture is actually something like the third floor of them! So you don't hear almost anything of the traffic even though you're walking right in the middle of the city. It startes at Bastille and goes all the way to Bois de Vincennes. 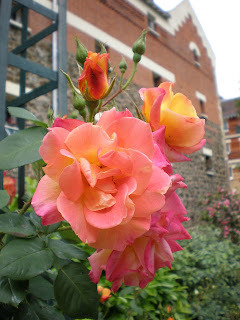 The roses have started blooming! :) Yay! I like roses a lot! And you know what? The weather forcast promises that the summer will start on wednesday with up to 25 degrees warm or more! Yippiii! But actually, it feels almost like summer already. Because even though it's raining, it's not at all too cold outside. It's like these really warm summer rains. Lovely! And we even had some thunder here in Paris too! That was cool. You can see a lot of lightnings up here from the sixth (or seventh) floor.